There are four systems of plumbing of drainage work in a building. 4. One pipe system partially ventilated. 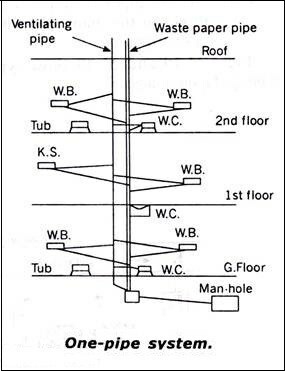 In this system, only one vertical soil pipe is used. The wastes from all the sanitary and soil appliances are discharged in the same pipe. The traps of WCs, sinks basins etc are directly connected to the single stack pipe. In this system there is no separate pipe for ventilation purpose. This system proves economical as only one pipe is to be provided. The effectiveness of this system depends entirely on the depth of water seal. No water seal should be less than 75 mm depth. In this system of plumbing the waste connections from sinks, baths, wash basins and the soil pipe which is connected directly to the drainage system. Gully traps and waste pipes are completely dispensed with. But all the traps of wC.s basins, etc are completely ventilated to preserve the water seal by a separate vent pipe. The following precautions should be taken in this plumbing system. a) All the joints off waste pipes should be air-tight. b) Each waste pipe should be connected to common stack directly. c) Vent pipe diameter should not be less than 50 mm. 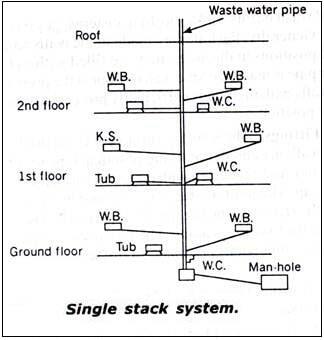 d) The waste pipe should join the stack, above the soil branch at each floor. e) All traps should be provided with a deep water seal of not less than 7.5cm. In this plumbing system, two pipes are installed. 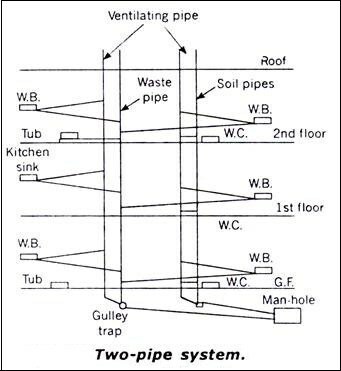 W.Cs and urinals are connected to vertical soil pipe baths, kitchens, basins etc are connected to another separate vertical waste pipe. Soil pipes and waste pipes are provided with separate vent pipes. This system thus requires four pipes and hence proves very costly. The soil pipe is connected to the drain directly but waste pipe should be connected through a trapped gully. This system is a via media between the one-pipe system and the single stack system. There is only one soil pipe into which all W.Cs, baths, sinks and wash basins discharge. In addition, there is a relief vent pipe which ventilates only the traps of W.Cs and urinals. a) Like one pipe system, it should be provided with deep water seals, at least 75 mm. b) The diameter of vent pipe should not be less than 5 cm. c) The waste pipe should join the stack above the soil branch at each floor. d) The fall or waste pipe should be continuous and gradual. 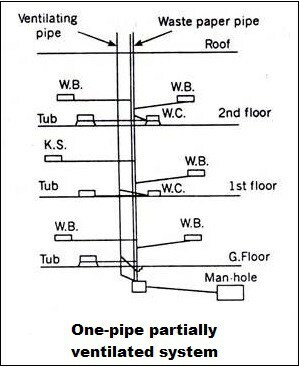 The slope of the waste pipe should be between 1 in 12 to 1 in 48. In India pipe system and sometimes one pipe system partially ventilated are in most common use. The plumbing system can be made more economical by compact grouping of fitments in both horizontal and vertical directions. This implies that if care is taken and ingenuity brought into play when designing the original building or building to be drained, it is possible to group the sanitary fittings and other equipment requiring drainage, both in vertical and horizontal planes as to simplify the drainage system and make it most economical.